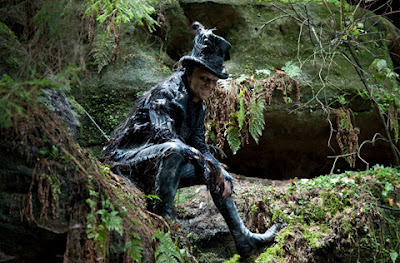 Okay, to put it simple, Cloud Atlas is a confusing as hell movie, but only if you miss a part or go and get popcorn during the movie. You actually have to pay attention to this one, and I'll admit, I tend to lose focus in some films. Not Cloud Atlas. There are some spoilers below, so for some of the text, I will be as careful as I can not to ruin the movie-going experience. :spoiler alert: Synopsis, the film tells six stories which all take place in a different location, during a different time period, and with different (but similar) characters. It spans 1849 all the way to the year 2321. The six stories share the common theme that the actions of one person can have big effects on the lives of others in the past and present. In a way, this film could be added to the entry of time travel films, but I think it rather fits along the lines of such movies as Magnolia, and others that tell stories that come together at the end, Crash for example. The concept isn't new, but the presentation in this film is unlike I've ever seen. I won't spoil the story, sufficient to say that you latch onto certain characters, and you really start to care for them as the film progresses. Through this method of story telling, you really do get engrossed into the story more-so than the average 88 minute film. This film runs a little over 3 hours including credits, but it leaves you wanting more. You actually want to see where the story goes, even though you can figure it out at the end. My favorite time periods the film is set in are the 1970s sequence, the 2012 sequence, and the 2144 sequence. I also really really like Hugo Weaving. I kept seeing Agent Smith from the Matrix, and Elrond from LOTR whenever I saw him, but nah. He's just a flat out good actor. I kept thinking that this movie is another one of those epic movies like the LOTR series is. I also have to give Tom Hanks much needed credit too. He performs no less than 7 characters in this film, each one with their own different aspects and purpose. My favorite roll of his was during the 1849 sequence. Tom Hanks nor Hugo Weaving aren't really the focus of the story even though they are in every one of the sequences. Two characters stood out to me as the most important, that of Halle Berry and an actor I swear I've seen before, Jim Sturgess. The rest of the cast is brilliantly chosen, and the stories kept my interest throughout each one. Some of them are funny, some of them are sad. The special effects of this film are very top notch, despite the film being an independent. Granted, it is the most expensive independent film ever made, with a budget well over $100 million. As I mentioned on Facebook, however, Hollywood needs these types of films more often. I want to return to a time when films were made more for the story and the characters than for profit (see the constant remakes and rehashes, and films like Twilight). I have not read the book, but I've read that the film makes more sense than the book does. Much of the budget likely went to the extensive (but strangely beautiful) CGI, and plus a hell-of-a-lot of makeup. I mean come on, Tom Hanks is seven different people. Halle Berry is as well as most of the rest of the predominant cast. As I said before, some may get lost, but stick with it. This film doesn't spoon feed you like the Bond movie out now does. It does require an alert viewer. I suspect subsequent viewings will help me better understand the story. The overall point... I didn't see much promotion for this film. I didn't see a trailer or clips. I did see the poster, and thought it would be another stupid kids movie like Land of the Lost, or whatever. I was wrong, and I was very entertained. A good way to kill three hours and get taken to a world far fart away. 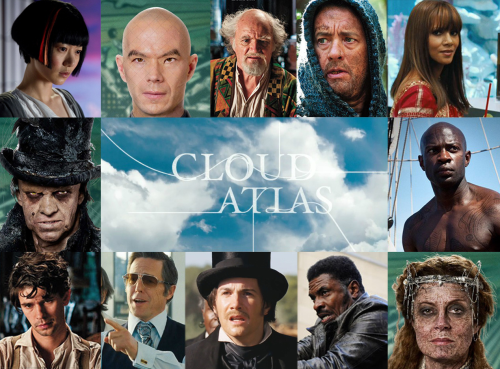 Cloud Atlas gets 4 stars out of 5. I think I liked it better than Skyfall. Come with me, and you'll be in six worlds of pure flatulation... oops wrong movie. Clockwise from top left... Hot Asian Chick (oates)...Fartsniffer...Old Farticus...Castaway Hanks...Ahhuu Berry...Amistad...Susan Sarandon...The head master from Underwear Soldiers...Flatch Hat...Pull My Finger Grant...Care to Oates, hea hea...The Demon Barber of Flatch Street.